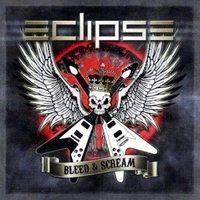 Swedish hard rockers Eclipse are back with Bleed & Scream, it's the follow up of their 2008 Are You Ready To Rock. It took them 4 years to come back with a new album, mainly because singer Erik Mårtensson has been producing, writing and playing with/for artists such as: W.E.T., Toby Hitchcock, Giant, Jimi Jamison. Heavy guitar riffs lead you into the fast Ain't Dead Yet, one of the songs which crosses the border between hard rock and heavy metal. A real anthem! Infectious! At A Bitter Taste guitarist Magnus Henriksson and singer / guitarist Erik Mårtensson show their talent at the six strings. The track Falling Down has a similar effect on me like some Hardline tunes... It hooked me up immediately - and it's one of the songs which you hear the first time and know it will be still one of you favorites 10 years from now! It's a timeless rocker! A fast, heavy rocker is Take Back The Fear which shows reminiscences to Dio and some fast melodic metal tunes... Fans of Axel Rudi Pell should fall for this one. The Unspoken Heroes is a melodic rocker which fans of Pretty Maids' Jump The Gun should dig... About To Break is a bombastic balladesque tune and the closer After The End Of The World is riff-based, keyboard-laden track. Again it reminds me of some stuff from the 80's, but it's pure fun. You see, this album will suit fans of Magnum, Axel Rudi Pell, Pretty Maids and Hardline at the same time. If you like hard rock and / or melodic heavy metal, check out Bleed & Scream! Well done, guys!